Over time, bad publicity is an inevitability. No business can operate forever without a failure, and those failures are bound to affect consumers. It’s important to accept up front that your business’ reputation is vulnerable to all manner of challenges and attacks, and can be undermined in the eyes of the consumer by the slightest thing. But don’t panic. Because bad publicity is in some degree inevitable, companies throughout the world have developed excellent systems for dealing with that bad publicity. Today, we are going to share some of the best strategies available, together with some examples of how companies have expertly reframed bad publicity to get a positive, constructive result out of it. We want to help you create a crisis management plan for your business, which will help you when you face a public relations problem in the future. What’s more, we will offer public relations crisis management examples of these principles in action, so you can see how to apply the ideas you find here. Only by understanding how to deal with it before it happens can you master the art of crisis management and response. The most important thing to remember is that bad publicity can happen at any time, so this strategy must be established and agreed upon within your business, so that action can be taken as swiftly as possible to maximize your effectiveness. The most important thing you can do right now to prepare your company for future crises is to perform an audit of your current media portrayal. How does your company’s image hold up against that of your competitors, and does the media portray your company in a way that is consistent with your values and messaging? If so, then congratulations. You are not currently in a state of crisis, and you can begin preparing for when you are. If the media’s messaging does diverge from how you want your company to be perceived, the tips in this section will give you a great step-by-step guide which will help you address your concerns and start to turn things around in a more positive direction. If a story breaks about your company that has negative implications, you need to establish whether the story has any truth to it. That means you need to assess the factual basis of the story. If there are any inaccuracies to how the story has been reported, whether it be in the core facts or the way the business has been characterized, you have an opportunity to challenge the publisher and set the story straight. You can make the best of this by appealing directly to your customers and your staff in response to the article. An unusual example might be when Guardians of The Galaxy director James Gunn was deliberately misquoted to create a sensationalist headline – he went straight to his Facebook page to reveal how the press had a played a trick at his expense, and the whole thing backfired on the media. This shows how easily something can be misrepresented as a smear, but it also shows how easily these things can be put right. If journalists or the people they’re talking to have gotten their facts wrong, averting a crisis can be as simple as simply correcting the misinformation. Negative stories come out about major brands like Apple, Facebook and Google almost every day. They have next to know impact on consumers however, because the amount of positive impact those brands have overwhelms the negative. You can criticize these brands, but ultimately it won’t stop you buying their products. You can do the same thing. You’ve heard that prevention is better than cure, and having a business that runs on trust and integrity is the best inoculation against negative PR. If you get a one-star review from a disgruntled axe-grinder, it won’t matter if there are 150 more highly positive reviews drowning it out. When you’re running a business that requires customers, you’re going to run into complaints. The internet is a hostile environment, and people are more aggressive in online comments than they might be talking to someone face to face. Diffusing complainers on social media can take many forms. One thing you can never do is ignore them. If you do, 45% will become angry. You must also remember that other potential customers are watching to see how you deal with complaints. Social media is a public forum, and proactivity is key. If your business can do anything to resolve the problem, make it public in a response to that person. Show all those watching what you are doing, and you can transform a negative review into a positive experience not just for that customer, but for potential customers who find the exchange when evaluating your company. If your business can’t do anything to resolve the problem, the most important thing is to be honest in understanding how this has transpired, what can happen to prevent it happening in future, and how you intend to compensate the person in question. People are used to company’s dodging responsibility. Showing honesty and humanity, and a willingness to learn from when you’ve come up short can earn you respect even in the worst cases. Social media is also a great platform for handling things with a lightness of touch and a sense of humour. Again, this proves authenticity and humanity in an increasingly sterilised world. Managing PR crises can also be about picking your battles. If the people posting negative things have relatively little influence, it can be better to let the comments fizzle out. Often, trolls will undermine their own credibility in their escalating attempts to grab your attention. This will expose them and hoist them by their own petard, without your getting involved. Equally, if a small story begins to gather traction and you weigh in making a strong official statement denying it, it can look as if you are genuinely worried about the contents of the story. Consumers are likely to believe there is ‘no smoke without fire’ and that your company protests too much too quickly. Indeed, many companies have made things worse by weighing in. Tesla’s Elon Musk made a huge faux pas after a passenger died while the car was on ‘autopilot’. His eulogy was a rant to defend his company, and ignored the human tragedy – highlighting the company’s role in the death while making them seem heartless. Silence, while not the ideal way to handle the incident, would have been preferable the way he chose. Data, data, data. Looking at these stories not as attacks but as data can depersonalize them and allow you to plan an equally sanitized response. If these news stories break, it is because something about them is significant, relevant and timely about them. That’s how journalists work. So if they break a story like this, they are demonstrating that story itself can be used against you. All good PR is about using the forces of story to create the messaging you want – negative press can highlight how you allowed those elements to align against you. Use negative press as a way to build your company’s robustness. Take on the challenge, face up to it honestly, and take what learning from it you can. How can you prevent similar stories from happening again? What preventative steps can be put in place to move your company away from events that create controversy? What proactive steps can put your company in on a more optimistic path to create newsworthy positive impact? Though it can be unpleasant in the short term, a PR Crisis can strength-test your systems and make sure you are handling things in the best way. Or, make sure you handle them better next time. Earlier this year, Pepsi created a pretty tone-deaf advert suggesting protestors and police should both relax and drink a soft drink pedalled by a millennial ‘celebrity’. The ad was roundly mocked by audiences, critics, and protestors for social justice. It was pulled, and they took full responsibility. They even apologised to Kendall Jenner publicly. For Kendall’s PR team, this was a major victory. She was the star of the ad and the one who initiated the controversial actions within it. They ensured the negative backlash was redirected away from her and landed squarely with the brand. It’s almost certain that if Pepsi hadn’t used their in-house creative team, they would have thrown their agency under the bus, like Nationwide or Groupon did. By deflecting the attention away from your brand and onto your suppliers, you can allow the blame to land where it really lies. You need to be careful about this however, as it could do lasting damage to your supplier relationships. You must ensure you have spoken to them and they are prepared to take responsibility before making any statement to the press. Doing this can disperse negative feedback. The simplest way to undermine any PR crisis is by having fantastic products and services that exceed expectations. Becoming the best in your industry doesn’t happen without actually being the best in your industry. PR can only ever reflect an ideal, and if you don’t live up to that ideal, doing so is dangerous. That’s why PR will only ever be as good as the product is serves to promote. Indeed, spending too much time on PR and not enough on product is a recipe for disappointment. Commit to making your products the best they can be. Commit to ensuring your customer service consistently goes above and beyond. Operate your company with authentically ethical values informing your choices and processes. This will all but guarantee any negative PR will be like water off a duck’s back. Think on this: Scandal rarely touches anyone who has honesty, authenticity and integrity. Malaysia Airlines flight MH370 disappeared on 8th March 2014, en route from Kuala Lumpur to Beijing. Its last known coordinates were far from any possible landing site and way off course, in the Southern Indian Ocean. Despite a Joint Investigations Team and the largest known search effort of its kind, the plane and its occupants were never found. Following this extraordinary tragedy was a litany of PR mis-steps, in the immediate, short and long-term aftermath of the incident. The first was that the airline didn’t inform the public the plane was missing until after it was due to land. It took until after the weekend for any details to emerge about where it might have gone, or what the aviation authorities knew about it. All this contributed to a sense the company was withholding information. Nature abhors a vacuum, and online rolling 24/7 news channels hate it even more. That meant the hole in conversation left by Malaysia Airlines’ lack of leadership in the messaging was filled by rampant speculation and rumour. By the time Malaysia Airlines were ready to speak about the events, they spent more than 20 different announcements denying, clarifying or deflecting these rumours and allegations, instead of controlling the messaging. This only added fuel to the fire. Finally, and most tragically for all involved, they were unable to provide any resolution. The plane is still officially missing. No one knows what happened to it. There has been no ‘ending’ to this story. There are still as many unanswered questions now as when it happened. So what can we learn from this? How could they have handled it better? There needed to be an immediate response, as soon as contact with the plane was lost and unusual circumstances had been established. Establish the plane was missing as soon as it was missing. Get out in front and lead the story, don’t chase it. Prioritize the personal care and support being given to every family of a passenger. Establish an investigation was underway and release updates from the investigation live, as soon as they were verified. Appoint a spokesperson whose job is to be the first point of contact, and have them establish regret and sympathy for the situation immediately. It is important to note that this would be challenging for the company to establish as a prevailing narrative after the disastrous incident in the Ukraine. That said, this tragedy should have allowed them to Listen and Build. After the Ukraine, few PR teams in the world should have more experience dealing with extraordinary, tragic situations than Mayalsia Airlines. When making statements to the media, ignore all rumours and speculation and stick purely to the facts. A rigorous pursuit of truth is underway – don’t let nonsense undermine it or distract from it – doing so is an insult to the families who need to know what really happened. It can feel impossible to find the positives from bad press, but they are out there somewhere, if you have the right perspective on the events and the right attitude to tackle them. The best thing that can happen from bad press is for it to have a positive legacy. People understand the idea of positive change and they respond to it. 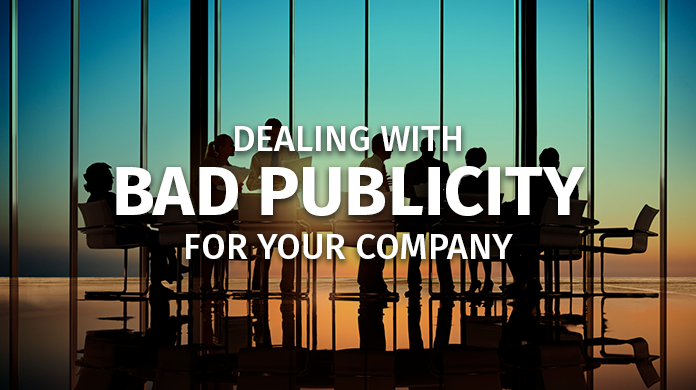 If you handle a PR crises well, you can transform bad publicity into good publicity, and make the best of your company’s increased exposure. Bad press doesn’t mean your company is bad – in fact, it can even help make you stronger. Do you have theories on what Malaysia Airlines could have done differently? Do you have other useful concepts for successfully dealing with bad press? Tell us in the comments section below. Annabelle is the head of marketing & branding. Other than generating sales, crunching calculation, and analyzing the market, another obsession of hers is the need to hunt for good food.